Since it’s the beginning of a new year, it may be the right time to think or re-think about the direction of your small business. Printers are an investment so there can be some pressure or stress about making sure you choose the best printer for your small business. We’ve compared all the specs, the sizes, the aesthetics, we’ve weighed special features against versatility. We’ve looked at the pros and the cons of the 2019’s best printers and we’ve put together our recommendations. Whether it’s printing costs, environmental concern, the quality of the print or even the print speed. 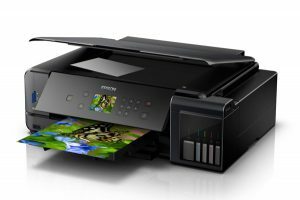 The Epson Expression Premium ET-7750 EcoTank is the best printer for a small business that needs versatility in a printer. This multifunction colour inkjet printer can print, copy, scan and can print paper sizes up to A3. It has Wi-Fi capabilities, a USB port, an SD card slot, and an ethernet cable. So photos and documents can be printed with no hassle at all. 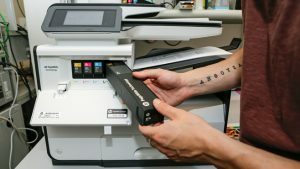 It can perform duplicate prints, it can connect to Google and Apple printing applications, and it’s five-colour ink system works amazingly with photos. 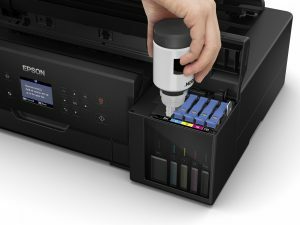 While it has an expensive initial cost, it comes with enough ink to print 3 400 photographs and the ink is cheap because the Epson EcoTank uses refillable bottles. Oh yeah, did we mention this printer takes leaps in terms of protecting the environment? Refillable bottles mean ink cartridges stay out of landfills – neat. While this printer’s ink economy and print quality is pretty hard to beat, it’s design is lacking in some areas. It has a small interface with no touch screen and it’s a touch clunky, taking up a fair amount of space and weighing in at 10.5kg. 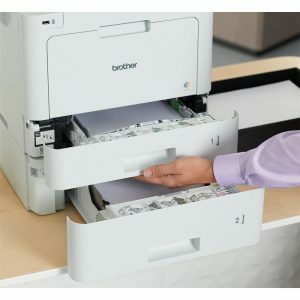 It also doesn’t have AFC, NFC, or faxing capabilities and has a small paper tray capacity (100 sheets or 20 photo sheets). 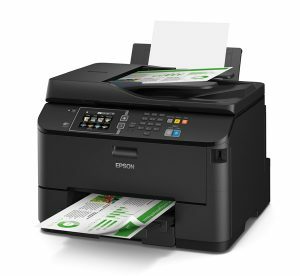 The Epson WorkForce Pro WF-4630 is the best printer for a small business printing high volumes regularly. This one’s impressive because while it boasts these really quick print times it still maintains the quality. This printer has all the necessities: wireless printing, scanning, copying, and reviews say they work pretty well, too. 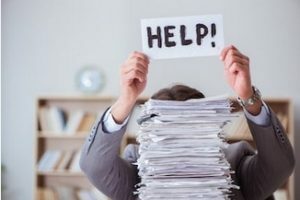 Unfortunately, it’s not ideal when it comes to photo prints or high-resolution design prints, but if you’re just printing paperwork and documents, this is the one for you. Somewhat taking a leaf out of the EcoTank’s book, the WorkForce Pro has taken steps to avoid environmental damage too (go Epson). 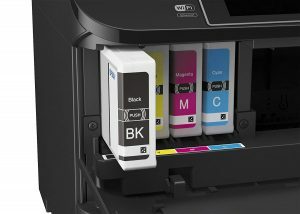 It uses larger XL ink cartridges so printing costs are minimised because it’s economical on ink, and again, fewer ink cartridges are finding themselves in the landfill. The economy of this printer is said to rival laser printing. 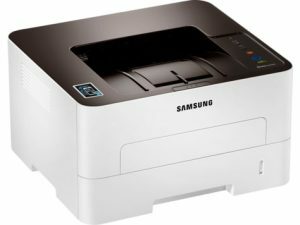 The Samsung Xpress SL-M2835DW is perfect for a small business looking for a smaller, more affordable printer with basic capabilities. 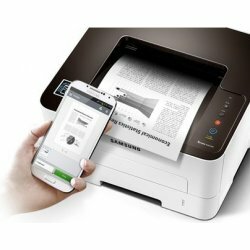 Some small businesses don’t need too much in a printer and this Samsung Xpress is for them. Weighing in at 7.4kg it’s not too large but it still has a decent paper capacity holding 250 sheets and a print speed of 28 pages per minute. In terms of paper sizes, it can print A4, A5, A6, B5, and C6. It’s easy to quickly send prints out with this one, it has wired capabilities as well as Wi-Fi and can be controlled via smartphone. It has a simplistic design so it’s really easy to use, understand, and troubleshoot with. This printer excels in black and white print quality and it has an ‘eco mode’ so you can control the amount of power and ink it’s consuming. 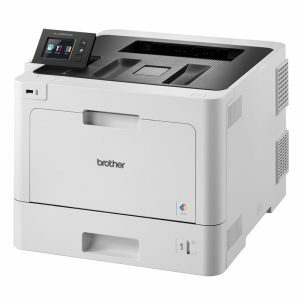 The Brother HL-L8360CDW is a great printer for the small business that’s on the larger side. It has monstrous capabilities; a print speed of 31 pages a minute and a capacity to hold 300 sheets but it’s monstrous in size too, weighing in at 21.9kg. The print quality is ace and reviewers say it doesn’t mess up when it’s running in over time. 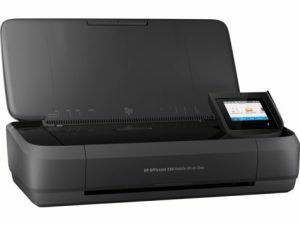 It has a low running cost, which is ideal for your small business and it works relatively as an all-rounder, although, it doesn’t have a scanner, unfortunately. This one is an economical choice for the long run with the only real downside being that it’s so large and heavy and doesn’t come with scanning or faxing capabilities. Obviously, our favourite thing about this printer is that it’s compact and it’s portable. This is the best printer for a small business that’s on the move. If you’re travelling to meetings all day, visiting clients on site, invoicing as you go… this is for you. In the grand scheme of printers, HP’s OfficeJet answer to portability isn’t great, but in the world of portable printers, it’s one of the best. It’s small enough to carry in a backpack and it has all the necessities, you can scan, copy, and print and most importantly, you can do it on the go. Not to mention, for the size of this one it has a really impressive print speed and a 50 page capacity. Lastly, but of course not least, the HP PageWide Pro 477dw. 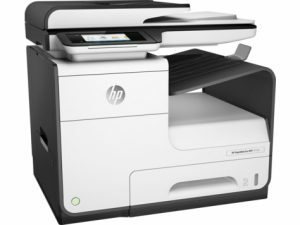 This one is by far the best printer for your small business in terms of capabilities. This absolute beast of a printer has a crazy impressive print speed, printing at 55 pages per minute. It has amazing paper handling, making jams a real rarity and it can multitask… it can print and copy at the same time. This multi-function inkjet printer has all that cool tech stuff, Wi-Fi and wired ethernet, a large and a touch screen LCD screen. It’s still perfect for the smaller office though, despite weighing in at 22.2kg it has a pretty compact size – it’s less than 50cm tall and just over 50cm wide. The only flaw that could be found in the HP PageWide Pro 477dw is that – in our opinion – it’s pretty ugly. This entry was tagged brother ink cartridges, brother toner cartridges, canon ink cartridges, canon toner cartridges, cartridges, hp ink cartridges, hp toner cartridges, ink cartridges, inkjet, printer cartridges, samsung toner, samsung toner cartridges, toner, toner cartridges. Bookmark the permalink.